This recipe features a part of the Cucurbita family (think pumpkin/squash) often forgotten: the seeds! Pumpkin-seeds, called pepitas in Spanish (derived from pepita de calabaza, meaning "little seed of squash") are as fun to cook with as the name sounds. Commonly used in Mexican cooking or roasted, salted and eaten plain; pepitas are nutty, crunchy and sweet, and bring a whole new dimension to this Whole Wheat Pasta with Pumpkin-Seed and Spinach Pesto dish. You can roast your own pumpkin seeds straight from the source, or purchase pepitas (pumpkin-seeds post shelling, roasting & salting) from the store. Pepitas are actually extremely nutritious: they contain heart-healthy monounsaturated oil and omega-3 fats, plus significant amounts of carotenoids, zinc, iron, magnesium, potassium, and protein. These nutrients contribute to pepitas' anti-inflammatory, liver-protecting and cholesterol-reducing properties. A few suggestions to add the nutrient-packed seed to your daily diet: toss into a salad, sprinkle in cereal, granola or trail mix, or grind a handful into veggie or meat burgers. Keep in mind though that similarly to nuts, pepitas are high in calories, so stick to a serving or two per use. The pepitas maintain the function of pine nuts in a traditional pesto, but deliver an authentically diverse flavor that makes this recipe so much more than your average pesto sauce. Even though this recipe is uber-healthy - add spinach to the mix and your dealing with some serious superfood action here - the focus lies in the robust flavors which blend together just right in the pesto. The refreshing crunch of the pepita-parsley-spinach-chive combination, with a twinge of zesty lemon, is finished with a thick dollop of creamy ricotta that mixes oh so well into the thick sauce. Don't worry if you're not a big spinach fan, you can omit the fresh leaves and substitute another vegetable. Plus, it can barely be tasted in the pesto mixture; the other flavors overpower. 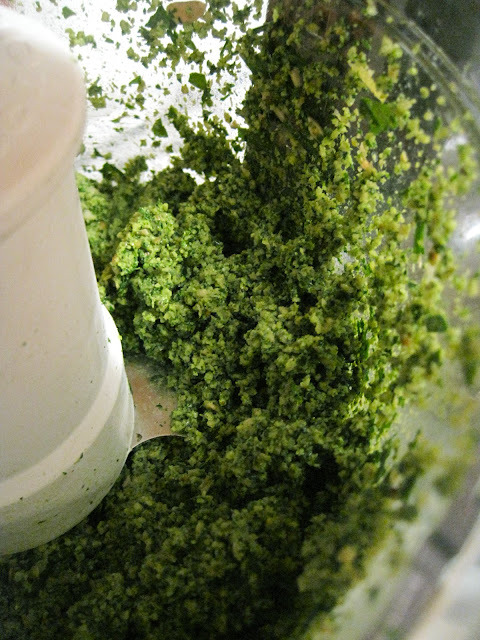 I loved this pesto so much that I made a full batch to use in the future as a topping for chicken or fish too. I mostly stuck to the recipe here (make sure to reserve that extra pasta water, otherwise pesto will be too dry) but added in lemon juice for some acidity and used less olive oil to keep the calories down. I also made a batch for 6 servings but found in reality it yielded only 3: my edits are below. *If already salted, skip adding salt to the pesto and just add salt to taste at the end. 1. Bring a large pot of water to a boil. Add pasta, and cook until al dente. Drain, reserving 1/2 cup cooking liquid. 2. Meanwhile, combine toasted pumpkin seeds, parsley, chives, oil, garlic, 1 teaspoon salt, the lemon zest, lemon juice, and 1 cup baby spinach in a food processor. Season with pepper, and pulse until well combined. 3. Toss pasta with pesto mixture. Add reserved cooking liquid (a little bit at a time), and mix until pasta is well coated. Fold in remaining 1 1/2 cups baby spinach. Sprinkle with remaining 1/2 teaspoon salt. Divide among bowls. Top each with a dollop of ricotta, and season with pepper and a sprinkling of extra pumpkin seeds, if desired. Minton, Barbara L. "Pepitas Are a Crunchy Munchy Snack Food Full of Nutritional Benefits." 14 Feb. 2009. Web. 1 Oct. 2012 <http://www.naturalnews.com/025621_pepitas_seeds_food.html>.